Following on from the famous Hebden 40 and the Hebden 401, our Hebden 402 ground reinforcement is probably the best available porous paving solution currently available. Made from 100% British recycled plastic, the Hebden 402 can carry up to 350 tonnes per square metre making it strong enough for any road-leagal vehicle in the UK. The unique locking mechanism avoids using clips underneath the grid so, in the case of unexpected maintenance to the ground underneath, for example, in the case of a burst water main, individual tiles can be removed and replaced without the need to remove the entire grid matrix. So what is it about Hebden 402 ground reinforcement blocks that makes them so useful? Partly, it is cost. Compared to other hard-standing or access route alternatives like tarmac and block paving, Hebden 402 is a fraction of the cost. A great deal of money is also saved on the installation costs, as around 75m2 can easily be laid in an hour by someone with no special training and only average fitness. The big deal for planners, and those seeking planning permission, is that when correctly installed with gravel or grass, Hebden 402 cellular paving helps prevent rainwater runoff, and therefore flooding. 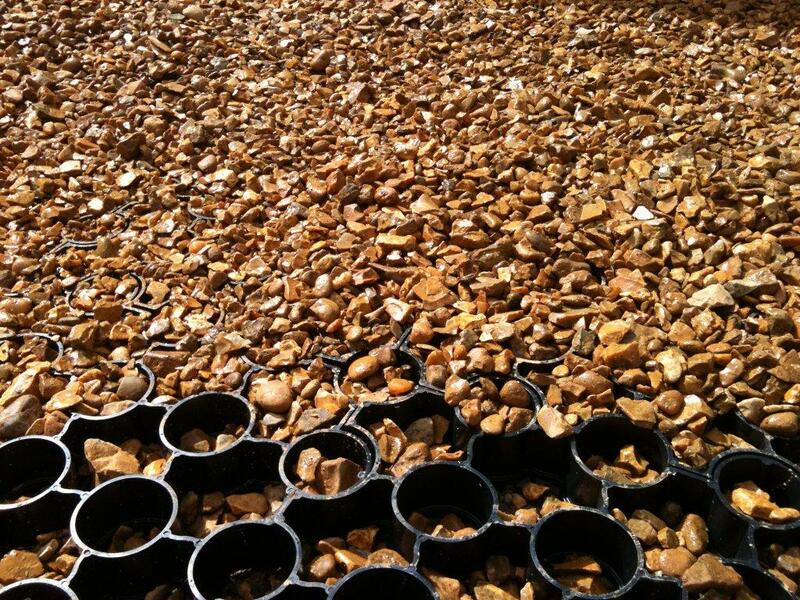 This makes it the perfect alternative to tarmac for driveways and parking areas. Further information about the Hebden 402 can be found here and to find out more about the great British Recycled Plastic range, please click on the Products tab at the top of the page or visit our main site where we have a considerable amount of further information.